Today’s Five Minute Friday word is laundry. When I received the email with the word prompt, I immediately deleted it. I enjoy this occasional writing activity, but am selective about the weeks I participate based on the word and if I feel that I have something noteworthy to share. Laundry certainly did not fit that bill. But then I remembered a brief moment of sheer joy last week when I completed what seemed like endless loads of laundry. After folding all the t-shirts and bottoms, I, per usual, tackled the sock pile (i.e., the bane of my existence). It was quite the pile of dress socks, work out socks, and Bridget’s cute little socks now that sandal season is behind us (sigh!). As I matched colors with each other and moved those matches to another pile, the original pile had dwindled, and eventually was down to two. And two socks that matched! Hallelujah! My first laundry day in as long as I can remember when I didn’t have the folded sock pile accompanied by a smaller pile of orphans. I smiled to myself, and then shared my good news with Brian, who chuckled and then went back to the football game. I felt an urge to post on Facebook, but then reality-checked myself that no one else would care about this meaningless event. So when this week’s word was laundry, I thought here’s my opportunity to share my news. When Bridget joined our family last year, I learned quickly that even though she was small (well maybe not that small compared to other newborns, but you get my drift), she was going to make big difference in our life. There were the givens; we expected less sleep with late nights and early mornings, higher bills, fewer date nights, more stuff, etc. And then there were the surprises; we really can function on little sleep, diapers cost how much?, date nights still end with a bedtime?, we have so much stuff that we have to move (literally). But then there was the unexpected; the experiences that no book, blog, class, or fellow parent can prepare you for; a toothy smile that makes you grin from ear to ear; a giggle that sparks an outburst of laughter; a complete conversation in which you didn’t understand a word but knew exactly what was said; enough fun to make those oh-so-early mornings worth getting out of bed for; an asleep arm because you just couldn’t move her on those rare, but amazing occasions when she lets herself fall asleep in your arms; and reliving all of life’s simple pleasures through her Dad’s big blue eyes. 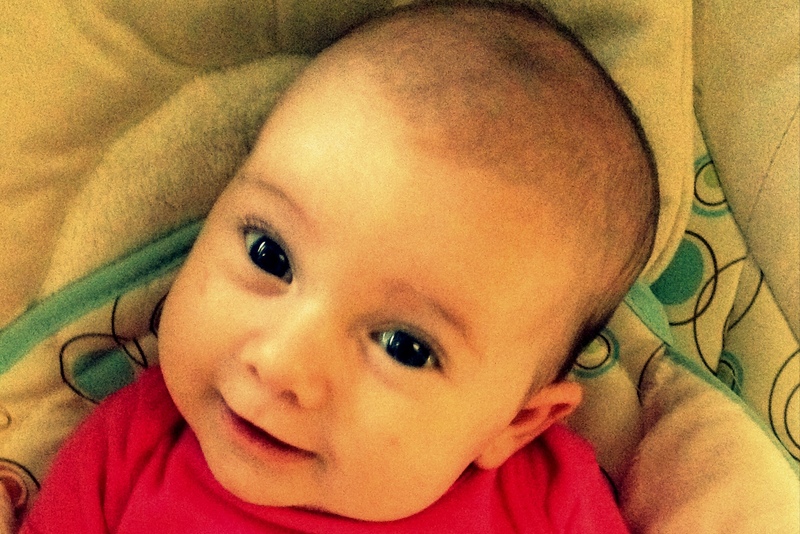 …the small joys of motherhood that make a big impact in life. This week’s Five Minute Friday word is connect. I found this word challenging. All I could think of when I read the word connect was Bridget’s link toys that connect with each other. I was determined to write about something more substantial than those, so hopefully I did. 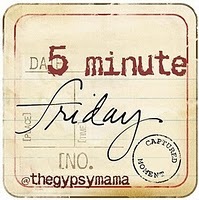 If you’re unfamiliar with Five Minute Friday, click here for more details and feel free to join us! I am not a spontaneous person. As much as traveling the world or sky diving on a Saturday afternoon may sound appealing, it’s not me. I’ve had the same job since I graduated college; I call my Mom at 5:30 every day; we order pizza every Sunday and watch Jeopardy every night. I am a person of routine and I like it this way. But when our sweet Bridget joined our family in May, that routine changed. When will she eat? When was her last diaper change? What time will we get her to sleep tonight? Will we get her to sleep? I now wake up and soak in her morning smiles, we take a walk around the neighborhood, and then I hold her while she naps. When Brian gets home, I catch him up on her day, we give her a bath, feed her, and rock her to sleep. And then we tiptoe upstairs, climb in bed, lay our tired heads on the pillows, hold hands, and talk. Not about feedings or diaper changes, but about our day, and us, and our future as a family. It’s 30 minutes where we connect again as Brian and Shannon. I find myself really enjoying this new routine. Unfortunately it’s just in time to go back to work. But, if I can squeeze those lovely smiles from Bridget and time to reconnect with my husband out of every day, I’ll be just fine with the our new routine. It’s Friday and time for another Five Minute Friday. As I shared last week, this is a brief writing exercise prompted by one word. This week’s word is here. It’s funny how such a small word can be so powerful: love, pray, here. In this fast-paced world, I fear that we’re not doing enough of enjoying here, and I’m guilty of this too. We’re cruising Pinterest, pinning images of bigger, better houses instead of enjoying here; the home we have filled with our memories and our photos. We’re at a party surrounded by family and friends, yet we’re more focused on who is doing what on Facebook. We’re Instagram-ing photos to post there instead of to remember here. And we’re too busy planning for next week and next month to truly enjoy the here and now…the only time we’re actually guaranteed. Yes, it is funny how such a small word can be so powerful. Here I go; making a greater effort to enjoy my here: my home, my family, my friends, my photos, my time. 3. And then absolutely, no ifs, ands or buts about it, you need to visit the person who linked up before you & encourage them in their comments. Seriously. That is, like, the rule. And the fun. And the heart of this community. I’m amazed at how much I’ve learned this past year about myself, my husband, our marriage, and our sweet baby girl, Bridget. Beyond the pains of labor and delivery were big blue eyes gazing back at me. Beyond the sleepless nights are beautiful smiles. Beyond the long day is a precious yawn. Beyond the endless walking, rocking, and bouncing is a heartbeat against mine and tiny arms wrapped around me. And beyond the fear of the unknown is the true joy of being a mother.